Latest leaked image of the Xiaomi Mi 5 surfaces with home button and thin bezels? 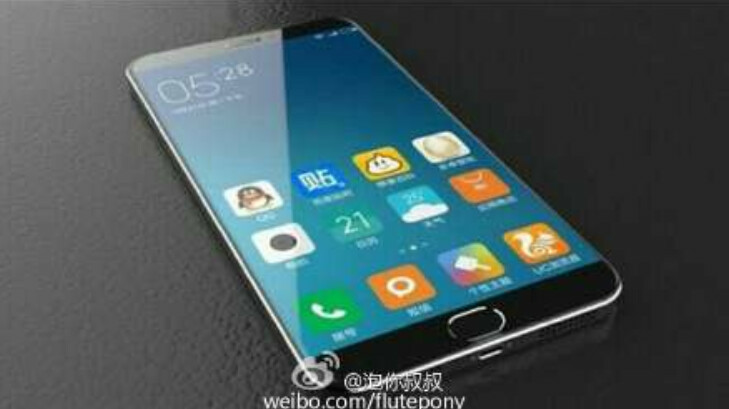 We've recently seen a couple of images allegedly showing off the Xiaomi Mi 5. Both pictures showed a device with thin bezels, and one was revealed to be sporting a home button. Today, a new image of the Mi 5 has appeared on China's Weibo site. Once again, we are treated to a screen with very thin bezels, a high screen-to-body ratio, and a home button. The image isn't as clear as the previous renders, although the features can still be discerned. While there is a resemblance to the previous leaked render, the picture did not come from an official source, meaning that we should take this with a grain of salt. Having said that, the home button is an important clue because it would seem to confirm some information that was passed along with the previous render. While earlier rumors suggested that the Mi 5 would be equipped with Qualcomm's ultrasound fingerprint scanner, analyst Pan Jiutang has recently stated that Xiaomi will use a more traditional biometric scanner on the Mi 5, which could be embedded in the home button. The bottom of the phone carries two stereo speaker grilles with a USB port (Type-C?) between them. And MIUI is running on the phone. The timeline we last heard had the Xiaomi Mi 5 becoming officially announced on January 21st, with the launch coming during the next month. Now all phones look alike. A physical home-button on a 2015/16 smartphone is just pointless and it destroys the beautiful design of so many phones. Though looks great it too looks like fan made considering some details. Agree (although I'm willing to make an exception if it also serves as fingerprint scanner). Um no. I prefer unlocking my gorgeous note 5 on the physical home button because many times, I have found myself using the fingerprint scanner when my phone is on the table. Looks more like meizu mx5. The physical home button looks ugly. The way I see it; Xiaomi is getting yet another step closer to iPhone... But feel free to disagree... P.S:- I'm not an "iFan"... Nor I'm a "Fandroid"... So, its a very honest and... Er... 'Genuine' opinion, trust me. Yes, its a rectangular phone with curved edges, a home button and a screen on the front. Looks exactly like the iPhone. Xiaomi leaked Mi5 phone photo look nicer than iPhone, narrow bezel much better handling with better screen to phone ratio. But feel free to disagree.... P.S:- I'm not an Fandroid... I'm not an iHater... So, its very honest and Er...'Genuine' opinion, trust me. Do you realize that your honest opinion based on a dubious source?